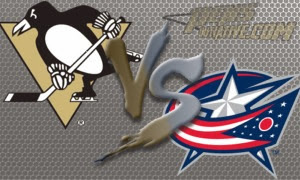 Last night the Blue Jackets hosted the Penguins in the second night of a home and home series. The Penguins won both games, including last nights game by the score of 3-0. Though last night the Bluejackets only managed to get off 19 shots, Zatkoff not only got his first NHL win, but he managed to do so with a shut out performance. Who would have thought that he could look better with a solid effort in front of him. Lets not get carried away, though there was moments where he was somewhat busy for the most part he was not tested in the game. We need to remember that we don't need him to be great, we just need him to be good enough. Last night, he was good enough. Pretty uneventful first period. For the most part it was all Penguins. They out shot the Jackets 10-3. Unlike the majority of recent away games for the Pens this season, they didn't swap penalties with the opposition. In fact, there was only one penalty and that was James Wisniewski who took a 2 minute minor for cross checking Malkin. Though not much more eventful than the 1st period, there was a little more action in the second. Pittsburgh Penguin sniper Deryk Engelland (second goal of the season) would get the games first goal after putting a pretty nice snap shot behind Columbus net minder C. McElhinney at 6:46 in the second period. The goal would not have been possible without a solid effort from Joe Vitale who earned his 4th helper on the season and a second assist would go to press box hero Dustin Jeffrey (first of the season). Both teams would accumulate 4 minutes each of penalty time. Pittsburgh took a too many men on the ice call, and Kris Letang took a roughing call. Easily the busies period for Zatkoff. The Jackets outshot the Penguins 9-5. A lot of this period was in the Penguins end. A solid effort for the most part as they were blocking a lot of shots in their end. You could tell that they were trying hard to get Zatkoff his first win. They didn't just play solid defense for this, they also put pucks in the net, AND FAST! .47 seconds in the period Chris Kunitz (eighth of the season) would score on a backhand shot with assists going to Pascal Dupuis and Paul Martin. The final goal was an empty netter when Jokinen scored with 38 seconds left in the period. Crosby and Malkin both assisted on the goal. Overall a solid effort from the team. Pittsburgh's next game is this Wednesday when they head to New York to play the Rangers. After a better effort last game the pens were 0/3 on the Power Play. Pittsburgh only gave the puck away two times, both were by Kris Letang. Letang also drew 2 of the 3 penalties that Columbus took. Pittsburgh won 28 of the 51 faceoffs. OH, AND ZATKOFF GOT THE SHUT OUT! Crosby won %68 percent of his draws. No need to boo him though, Pens fans. Maatta blocked 4 of the 15 blocked shots by the Pens.